RCN members were urged to 'get involved, to get active and get campaigning' in a passionate opening address to congress by RCN president Cecilia Anim today. 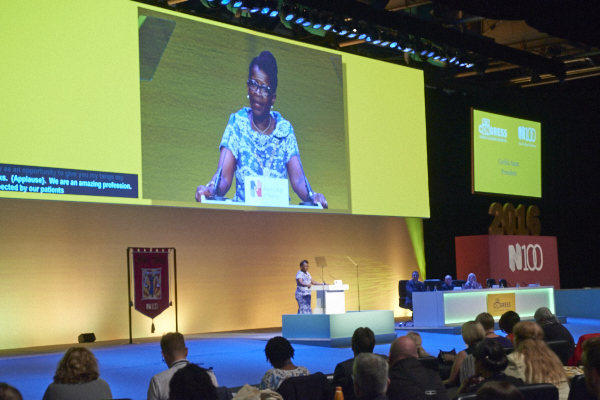 Addressing more than 1,000 nurses at the Scottish Exhibition and Conference Centre (SECC) in Glasgow, Ms Anim called on them to 'fight for nursing'. Achievement, commitment, professional pride and a century of nursing excellence were also celebrated in the speech. Ms Anim explained how the event is special this year as it is 100 years since the RCN was founded. It is also the first since general secretary Janet Davies took charge. The opening ceremony began with a procession led by pipe major Stuart Mackenzie and featured a commemorative banner created by members of the Townswomen’s Guild. There was also a performance by the NHS Forth Valley Nurses’ Choir. Ms Anim paid tribute to the work of the nurses she has visited across the UK and praised them for continuing to stand up to the challenges faced by the profession. She explained how from humble beginnings, founded by just 34 people, the college had grown in strength and now boasts a membership in excess of 435,000. Urging all members to ‘come together, galvanise the membership and use their voices’, the president issued a rallying cry ‘fight for nursing’ which drew applause from all around the hall. Earlier, a video celebrating the centenary was shown which paid tribute to the ‘professionalism, innovation and spirit’ of nurses and promised ‘we won’t stop now’. Audience members were also invited to stand and give a minute’s applause in honour of former agenda committee member and leading LGBT role model Dominic Walsh, who died aged 36 on International Nurses Day (May 12) this year. As an added tribute chair of council Michael Brown revealed the SECC conference centre had agreed to fly the Rainbow flag for the duration of congress. Debates at congress will include discussions and resolutions on a range of nursing topics from student bursaries, pay and safe staffing to wider issues such as sickle-cell disease, abortion and dementia.